The colours for Project Spectrum this month are purples and violets - perfect. I have been lazy some months with the colours, but this one is right up my alley. Gives the ideal excuse to showcase and catch up on a few creations from the last week or so. Other Hats are on the make, but need to remain secret for now, so let's talk about spinning. Yeah! After saturday's workshop, and prior to stripping my baby down for painting, I tried a couple of plied skeins (which is when I decided I must have a jumbo bobbin - can't stand having knots or joins) The first one was spun from one of the hand-dyed tops I bought at WoolFest in shades of lilac and purple - it spun beautifully! So smooth and quick. 100g, English wool. The colours have blended and become a bit muted, but that's fine. Plying was a dream - it was a nightmare with the spinning drill, but now I have an on-board lazy kate and I'm a happy bunny. Then I dug out some Shetland Moorit that's been sitting in my fibre stash for some 7 years (!) It's one of those browns that could so easily look really naff, so I plied it with some fine boucle mohair that I bought a while back from Handweavers when I was out with Flossie. The mohair is soft shades of purple through to heathers, and works really nicely against the natural colour of the Shetland. Again, it spun wonderfully though I did get a bit tangled at one point when plying (I've discovered there is a knack to plying with the on-board lazy kates - using your hands to tension, and making sure the yarns roll of the bobbins in the same clockwise direction) Didn't use all of the 100g of the Shetland, so with the mohair there maybe about 70g? Not sure. Can say though that these yarns are loftier than the first single I spun on the baby, and so have much better yardage. 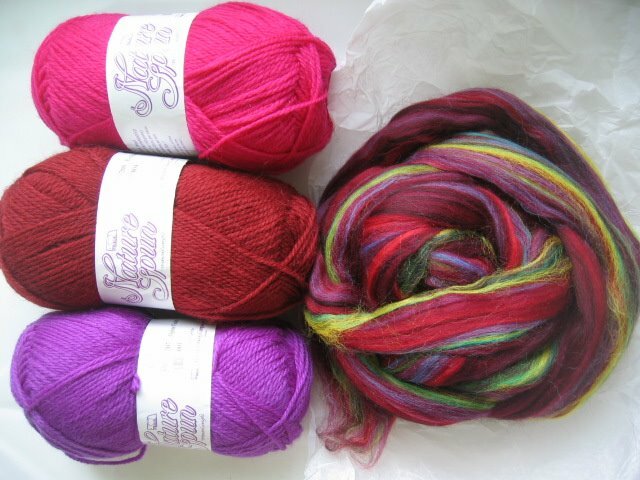 Stashalong hasn't been mentioned here for some time - kinda find it easier not to keep mentioning that I'm trying not to buy yarn, else I'll get tempted. From the start of April, I was a very good girl. Apart from the one day out, I didn't buy anything for 2 months! No frittering, not even any temptation. Infact when I tried to online shop, I could only browse. The rules state that you're allowed one day per month to relieve tension and grab yerself some new yarn. So, towards the end of June I did manage to place a couple of orders online, on the same day although they arrived seperately. WoolFest mega shop was on the 1st July, so I'm still playing the game by the rules (just). 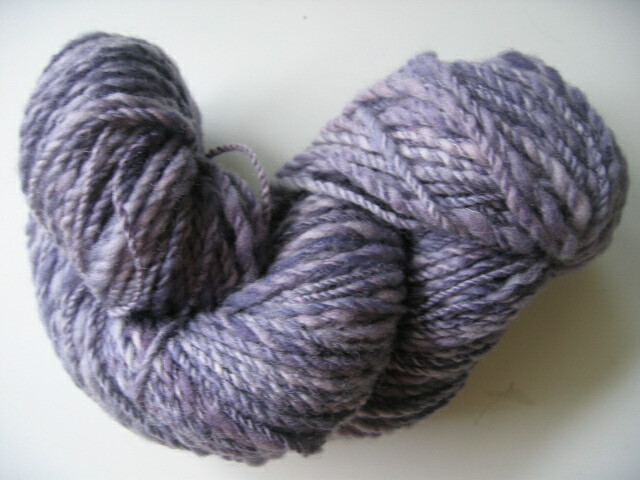 First we have some hand-spun and some hand-dyed from this Etsy seller. The hand-spun is a mixture of wools, mainly merino in parrot shades - lovely! 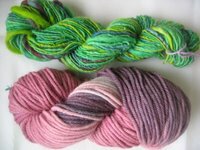 The hand-dyed is a merino and alpaca mix and is wonderfully soft. Have completely forgotten how much there is of each, but probably enough for Hats. I know I could do these meself, but you gotta buy other folks' creations, don't you think? Apart from supporting the community, it's lovely to buy something made by another. The one thing I'm always in need of is plain dyed regular yarns. 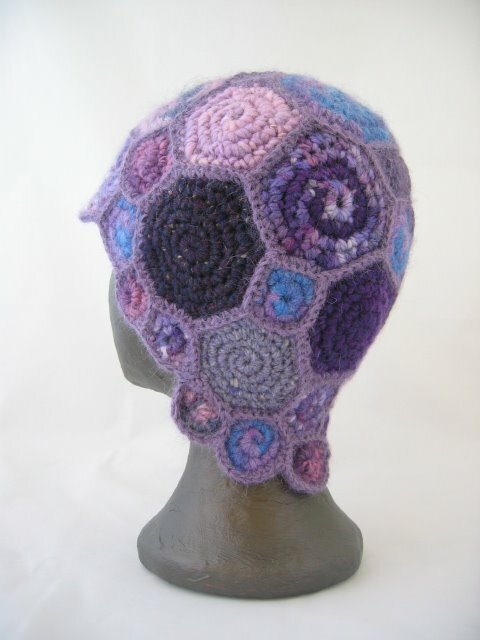 I never seem to have enough, and the spiral Hats have eaten a fair chunk of what I had. So I go this little lot from Elizabeth's Fibers. Then some Brown Sheep Nature Spun and merino roving. The Nature Spun feels like any other good quality Aran, light and lofty. But it is the Lamb's Pride that I'm smitten with. It's gauge and texture is similar to Maya and my all time faves, handpainted yarns (except in plain colours). A lovely soft, single ply which always wins me over. Why can't we get more yarns like this this side of the water? It ain't fair, I tell you. Blimey, think I'm now up to date with creations and purchases. Right, I'm off to do the last few bits of painting on my baby and then an acrylic varnish - she'll up and running with her new outfit very soon!